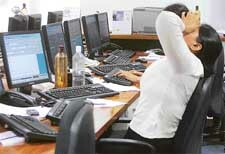 Sensex plunged a steep 826 points in the wake of a global meltdown, taking the index to 11,391 at close. In the broader markets, Nifty also fell by 6.8 per cent or 246 points to close at 3,389. 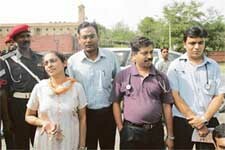 With a late night meeting between the agitating students and Union Minister Oscar Fernandes remaining “inconclusive”, the government’s attempt to persuade medicos to call off their stir came a cropper, as the students decided to continue their indefinite strike. Compelled to undertake a delicate balancing act with union Human Resource Development minister Arjun Singh having raised the pitch for 27 per cent reservation for OBCs in institutions of higher learning much to the bewilderment of the Congress leadership, the Committee constituted by Prime Minister Manmohan Singh held its first meeting here today. In a historic step, Nepal's Parliament today unanimously decided to drastically curtail the King's political and military powers by stripping him of the title of the Supreme-Commander-in-Chief of Army. 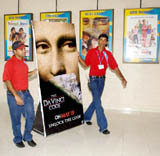 The Central Board of Film Certification (CBFC) has given the go-ahead for the screening of the controversial film ‘The Da Vinci Code’ and given it an “adults only” certification. The film will be screened minus any cuts and will be preceded by a disclaimer. The project of Reliance Industries Limited for procuring vegetables and milk in Punjab will carry on as scheduled. Close on the heels of a lady officer alleging sexual assault by her commanding officer, another case has come to light where a lady officer has alleged molestation at the hands of a senior officer. Barely 48 hours after the sensational heist, the burglars in the Alukkas jewellery theft case were caught by the Mumbai police today. President Pervez Musharraf has banned veteran Bollywood actor Feroze Khan from entering Pakistan after his reported remarks highlighting comfort levels of Muslims in India in comparison to that in Pakistan triggered a nationwide controversy.